Would You Rather Be Holding Crypto or Cannabis? Does BC Prioritize Fracking Over Food? The matter of the construction of large scale industrial solar and wind renewables has been of concern to me since 2010. At that time I embarked on what would become a filmmaker’s life-journey, documenting a massive scale industrial development agenda, justified by “The War on Climate Change,” that played out across the deserts of Southern California. The justification for siting over 200 industrial facilities across this remote region, characterized by pristine ecosystems and thousands of years of American Indian culture and antiquities seemed specious, as Germany added 500 MW a month of renewable energy on rooftops and parking lots, close to where it would be used. Through following a series of proposed industrial solar projects, and documenting opposition to them — I came to learn new lessons in the importance of simple things. It was humbling to film and describe the federal government’s approach to this mega-scale solar industry land development. Public land was leased at bargain rates to project developers from a variety of countries. Project budgets would run up to 2 billion dollars and developers stood in line to receive 30% “up-front” cash grants. The level of complexity was staggering, as was the potential financial reward for industry. The opportunity to stimulate the economic resources of communities through support of local rooftop solar was avoided, while American Indian antiquities were bulldozed. The pro-large solar argument had been made by the California Energy Commission, as early as Summer, 2010. The California Renewable Portfolio Standard (RPS) is one of the most ambitious renewable energy standards in the country. The RPS program requires investor-owned utilities, electric service providers, and community choice aggregators to increase procurement from eligible renewable energy resources to 33% of total procurement by 2020. In response, decisions would be guided by “Overriding Considerations” the perceived necessities involved in meeting the RPS standard. Local economy, conservation and culture would take a back seat. As individuals we may express a preference that the last stands of rare plants like the Crucifixion Thorn not be removed from the planet, or that large solar “Power Towers” like those at Ivanpah, the first utility scale mega-solar installation not incinerate birds migrating along the Pacific Flyway, or that thousands of protected Desert Tortoise not have their burrows graded, their young (and eggs) obliterated, and adults’ habitat removed forever. We may prefer, politically, that the American “boom and bust” cycles of Western development, be avoided in favor of the slow and steady persistence of communities, hanging on to life in a parched landscape of mysteries and spiritual connection to the land itself. But the CEC had their marching orders in light of the RPS. Most Americans, rightly and wrongly, assume that amid calls for sacrifice, whether in actual war, or in the so-called “Great War on Climate Change,” things get a little off-track. But as Rumsfeld states in the famous quotation above, we don’t know what we don’t know. Sand transport paths. 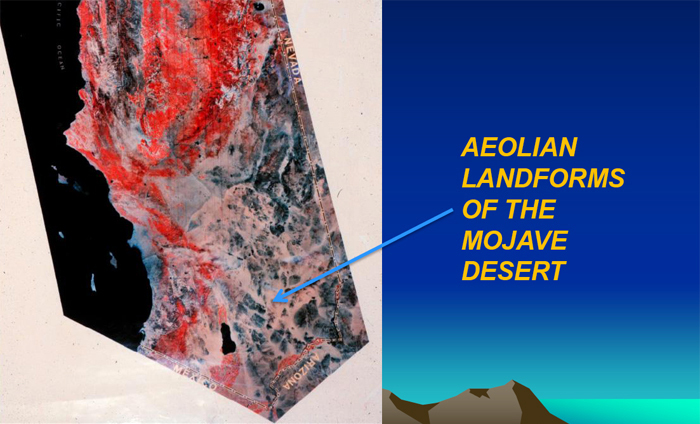 “Aeolian Sand Transport Pathways in the Mojave Desert” USGS. Seen from above, the topography of Southern California is a “Basin and Range” landscape of mostly north-south parallel mountain ranges. Major ranges to the west like the San Gabriel, San Bernardino and San Jacinto Mountains are upthrust from the San Andreas Fault. The Garlock Fault forms the Tehachipis, to the northwest. These mountains are the divide between the semi-arid coastal plain and the Mojave Desert. These ranges block incoming storms from the Pacific, forming “rain shadows,” where descending warm air creates desert conditions. Pat Flanagan, desert conservationist and board member of the local Morongo Basin Conservation Association, was the field biologist monitoring birds at the prototype Solar One facility at Daggett, in 1983. Today, still surveying the ground, she sees sand–wind blown (aeolian) sand, remnant from a vast array of interior lakes, whose drying began in the late Pleistocene Epoch with the end of the last Ice Age. 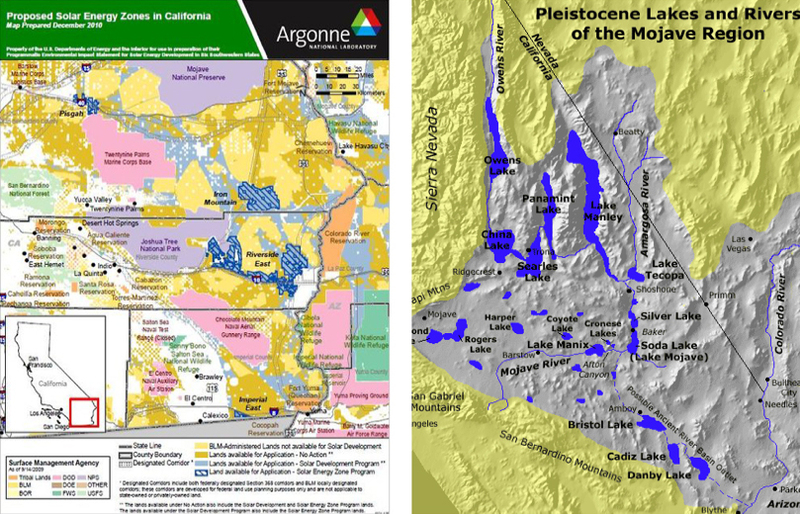 A side-by-side visual comparison of Southern California solar zones and the location of Pleistocene lakes indicate a similarity in geo-location, which confuses avain species instinctually navigating the Pacific Flyway. This helps account for avain mortality at solar facilities like Ivanpah where birds mistake mirrors for water and attempt to land and rest. Ironically, solar fields built where Pleistocene lakes once filled basins create both a dangerously faux landscape and a new demand for water where none exists today. In fact, the sand dunes, and sand sheets, unique features in the Mojave Desert ensure the 22 million acres described by the Desert Renewable Energy Conservation Plan for the siting of large solar projects, is on the world’s research map, along with the Sahara, as a world class sand transport laboratory. Some large scale solar projects are to be put in the Silurian Valley, a magnificently beautiful landscape of purple mountains and unspoiled vistas, and others are to be located in and around Tecopa, a resort and spa area. While this may seem inconsistent from the standpoint of conservation values, it is desirable for companies to locate solar fields on slopes of less than 5%, to have maximum control over the positioning of arrays. This most often means locating them at low or negative altitudes on sand deposits and transport areas. The criteria by which projects are to be sited thus follow construction prerogatives. origin, or are fine grained alluvial deposits, and thus are susceptible to eolian dust and sand transport, especially after disturbance. In addition, in this slope category, 89% of the area is susceptible to flooding based on the age and geomorphology of alluvial deposits. These maps are examples of several we present for decision-making with respect to hazards and ecological attributes in the face of climate change. The Silurian Valley, in particular, demonstrates the myriad problems created from a focus on slope as a single determining factor for project siting. 17,000 acres in the Silurian have been proposed for the eventual development of solar and wind. The Silurian Valley is the end drainage for the Mojave River, which sources in the San Bernardino Mountains, and snakes east and north toward Death Valley. The valley is one of the most dramatic examples of a “sand transport area.” Enormous sand sheets bury mountains to the east, driven by westerly winds. The area is a wildlife corridor between two National Parks, Death Valley and the Mojave National Preserve. It is also an avian migration corridor. And, the area is along the auto route from Palm Springs to Death Valley, one of the top destinations for Canadian, French and German tourists, who come for unspoiled vistas. 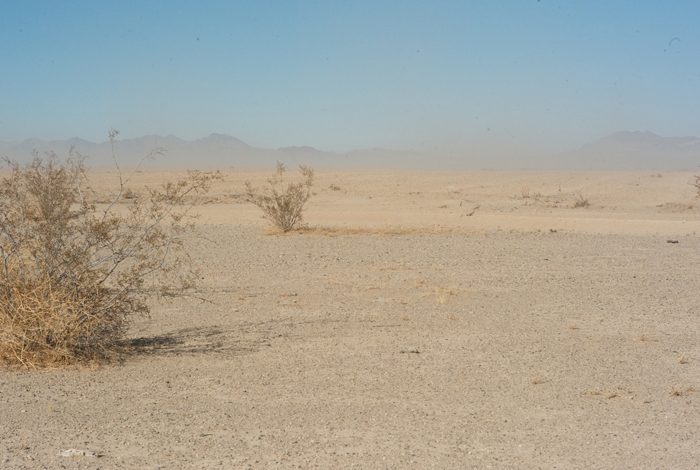 A study of 77 soil types in the Mojave River Area, San Bernardino County, by the USDA Soil Conservation Service finds that as the as the river descends into basins, taking into account degree of slope, water erosion, and root depth, 31 have a “high hazard” of soil blowing, and 13 demonstrate a “moderate hazard”. These soil types include Bryman loamy fine sand, Cajon sand, Cajon-Wasco, cool, complex, and Lovelace loamy sand. Photo Caption: Airborne dust from grading private land outside Blythe, California, rises from the desert floor. On desert pavement, a monolayer of pebbles overlies a stone-poor to stone-free matrix of silt, clay and fine sand, derived principally from wind-blown dust. When grading takes place, the desert pavement is scraped away leaving powdery soils, which become airborne, creating Dust-Bowl like conditions. Photo: Lundahl. It is sand, that very simple and obvious fact of the desert, that the federal government has seemed to ignore in the DRECP. Although large scale projects have been proposed at sand transport locations such as Ford Dry Lake (Genesis) exposing them to disastrous flooding in 2013, even claiming the lives of two company representatives downed in an observation plane surveying the damage, this kind of impact was perceived as disconnected from the whole. The realization that there is sand in the desert, continually moving, blowing, flowing, relocating in a vast transport system dating back thousands of years and inhibiting construction activities seems to have escaped policy makers and applicants alike. 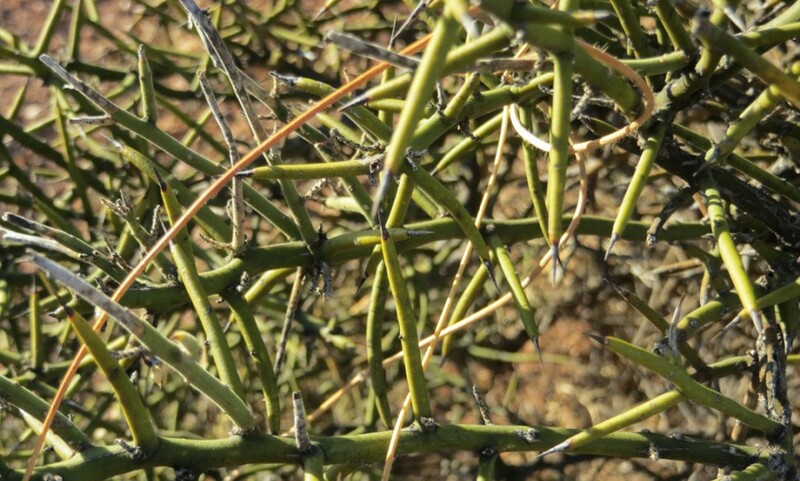 Plants hold sand in place, along with mycorrhizal fungi associated with those desert plants. When plants are removed, ancient sands begin to travel. Pat Flanagan points out, it is not only about sand, but water. California has experienced an epic drought of four years duration. The drought has been caused by a resilient high pressure system pushing Pacific Storms far to the North. While researchers indicate there appears to be no direct link to climate change, Marty Hoerling, co-editor of a climate report published in the Bulletin of the American Meteorological Society, and a research meteorologist with the National Oceanic and Atmospheric Administration, noted that high-pressure systems have increased everywhere. While climate change makes extreme weather events like the California drought ten times more likely, natural variability plays a much larger role. Comparing the periods of 1871-1970 with 1980-2013, the authors wrote that there was “no appreciable long-term change in the risk for dry climate extremes over California since the late 19th century.” California has always been prone to drought, as long term residents like Flanagan appreciate. 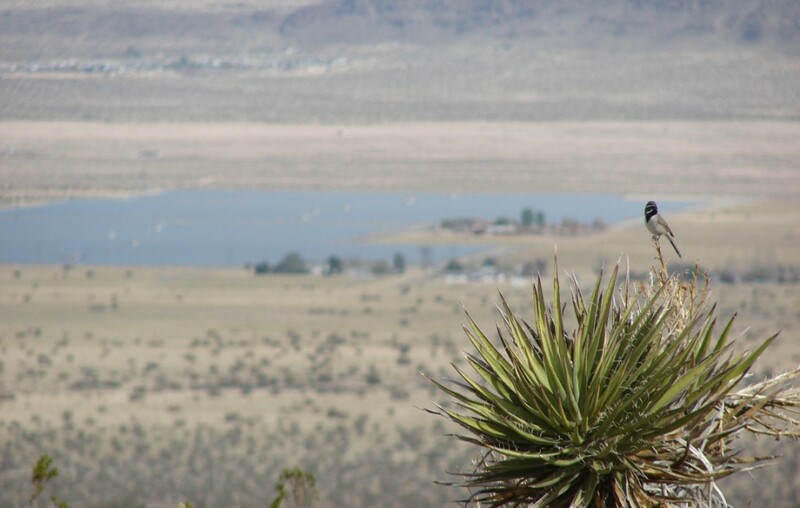 It is especially a fact of life amid the Mojave’s varied “Basin and Range” topography, a fact of life that state and federal entities overlook. Large solar projects spread across multiple square miles, whose permitting requires water for construction, mirror washing and other activities, may have significantly underrepresented required water usage. Joshua Tree’s Cascade Solar project, at Coyote Dry Lake, requires ten times the water estimated to tamp down and manage sand and silt at the project, particularly during construction, but also during times when the wind is up. Original estimates of .07 acre/feet usage per acre expanded to actual usages of .7 acre/feet per acre. Sparrow. Lake effect, Cascade Solar, Coyote Dry Lake. Photo: Deborah Bollinger. Where will the water come from in an arid region that is potentially growing even more arid? 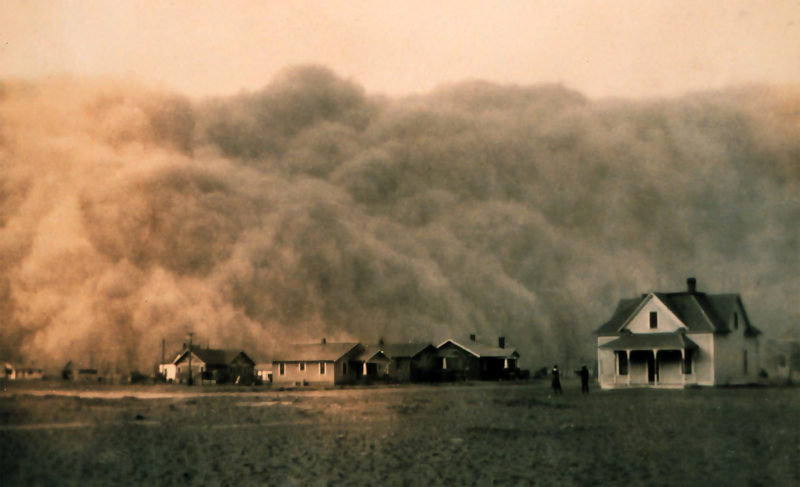 The larger question looms: In light of required grading and soils disturbance on such a massive scale, blowing silt threatens to turn a land of ancient soils and delicate ecosystems into an unmanageable “dust-bowl,” an unusable and unstable sacrifice zone of previously unseen proportions. Whereas the dustbowl areas of the Great Depression throughout the Midwest were able to remediate themselves by virtue of access to water from many rivers and streams, the same may not be said for the Mojave Desert. The importance of simple things, and their ignorance, may unleash unintended and cascading consequences. Perhaps that is because their feet are not in the Mojave, nor are they in Southern California, but in Washington DC, and Sacramento, and other densely inhabited cities where the Earth beneath their feet is covered with concrete and asphalt. As Donald Rumsfeld so stated, the unknown unknowns are the difficult ones. *Over 200 are proposed and with many approaching 8000 acres, that equals 2500 square miles, a potential land area larger than the state of Delaware. ©2014, Robert Lundahl, All rights reserved. Reprint by permission only.